Due to extensive renovations our pool and spa will remain closed until March 1st. We apologize for the inconvenience. The Hampton Inn Hanover hotel is located just east of Route 94 on the corner of Eisenhower Drive and Wilson Avenue in north suburban Hanover Pennsylvania. Area attractions near this Hanover Pennsylvania Hampton Inn include golf courses historic sites state parks and outlet malls. Gettysburg National Park is located 14 miles west of the hotel and Hershey Park is 50 miles north east of the hotel. Guests can dine at a variety of nearby restaurants including Perkins Red Lobster Texas Roadhouse Chili*s Ruby Tuesday Olive Garden or Bay City Seafood. 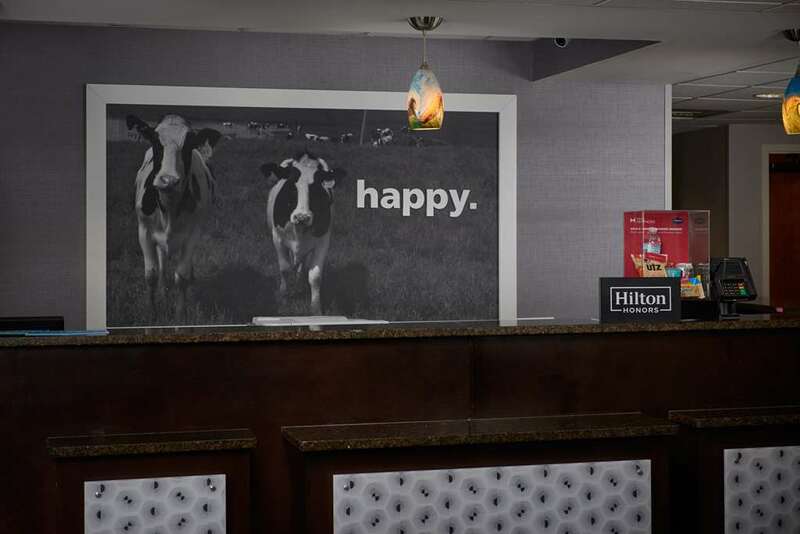 The Hanover Hampton Inn in Pennsylvania features 83 hotel rooms filled with amenities including a coffeemaker iron ironing board and hair dryer as well as complimentary WiFi and cable TV with movie channels. This Hanover Pennsylvania hotel also offers connecting rooms rollaway beds and cribs and an on-site coin laundry. Sure to please the busy executive or leisure traveler Hanover Hampton Inn hotel guests can enjoy our complimentary On the House hot breakfast buffet served daily and Monday through Friday complimentary On the Run breakfast bags. Guests staying at the Hanover Pennsylvania Hampton Inn can enjoy the convenience of complimentary WiFi in the hotel lobby meeting rooms and all public areas as well as coffee and tea 24 hours a day in the hotel lobby. Hampton Inn Hanover Pennsylvania hotel guests can have fun or relax in the indoor swimming pool and whirlpool work out in our fitness center or utilize the hotel meeting and banquet room that accommodates up to sixty people. Audio/visual equipment is available for a nominal fee. All stays at the Hampton Inn Hanover hotel in Pennsylvania are backed by our 100 satisfaction guarantee. If you*re not satisfied we don*t expect you to pay. That*s 100 Hampton. We love having you here at the Hampton Inn Hanover Pennsylvania.